Translation: "It is solved by walking." Sleep-walking or a condition in which a person is walking while asleep or in a hypnotic trance. A reference to walking, or tending to walk, when one is sleeping: Hector's somnambulant behavior usually occurred after he had been asleep for about two hours. © ALL rights are reserved. A reference to walking or doing something else while asleep or in a sleep-like situation. To walk or to perform another act while asleep. The action or fact of walking while asleep or in a sleep-like condition. A person who walks while he or she is asleep. Getting up out of bed and walking around while in a state of sleep which usually takes place in the first third of the night and lasting a few minutes or up to a half hour. A reference to walking when asleep. 1. 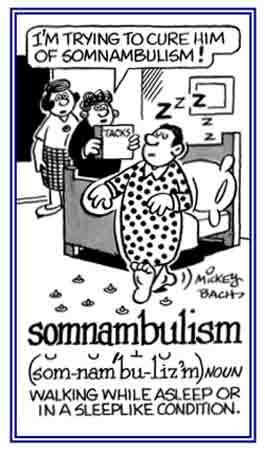 A procedure that involves getting out of bed and walking around or performing other complex motor behavior while being asleep: The individual who is experiencing somnambulism is relatively unresponsive, not alert, not easily awakened, and often does not even remember what was going on at the time. 2. 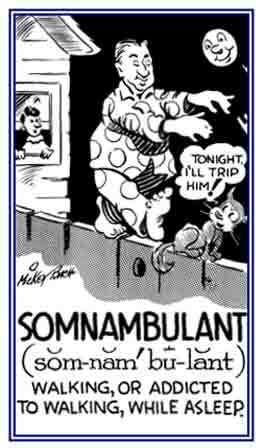 Sleep walking is described by some medical people as "a partial arousal disorder", in which a person is not fully asleep but who is also not completely awake: Somnambulism can be caused by sleep deprivation, alcohol, fevers, stress, or by some mental and neurological conditions. Because of his chronic somnambulism, traveling independently was a risk for Sarah's son; so, he always traveled with a friend or a member of his family. 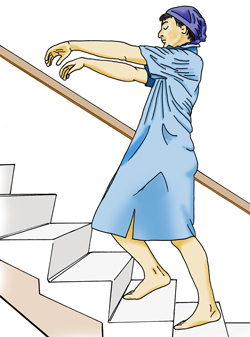 Anyone who walks around while asleep: Just as the somnambulist reached the top of the stairs, his mother shrieked, and fortunately, he woke up before falling down the steps. Showing page 6 out of 7 pages of 93 main-word entries or main-word-entry groups.